Tearful Olubunmi Funke, a single mother, yesterday disclosed that she sold her three years old daughter to one Abibat Oyesanya, a member of child trafficking ring to enable her offset a crippling debt burden. 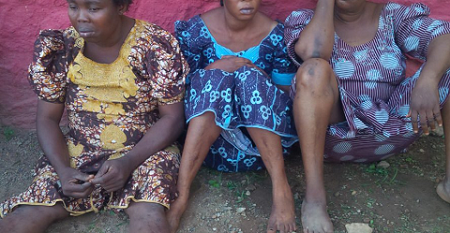 Funke who said she even took to prostitution to raise money to pay the debt when her husband sent her away from matrimonial home, added the syndicate who allegedly specialized in child stealing and kidnapping in South West, bought the little girl off her for N280,000. She made the disclosure to reporters at Eleweran, the Ogun State Police Command Headquarters where she was paraded along with two other women, Abibat Oyesanya Morenike Shittu in connection with trading in children. “I gave out my three year old daughter to Abibat Oyesanya who is into local adoption business. But she promised me that I would be allowed to visit my daughter once in three month. “I am a prostitute. I engaged in prostitution after my first husband sent me packing. So, I decided to give out my daughter to woman who gave me N280, 000. I used the money to offset my debt.